Author R. J. Lee has been writing humorous novels about the South for years. But this year, Lee wrote his first mystery novel, “Grand Slam Murders.” He will read from and sign the new book at 5 p.m. tonight at Off Square Books. The book, which is the beginning of a series called “The Bridge to Death Mysteries,” begins when four widows are found dead at their bridge table, bringing the small fictional town of Rosalie, Mississippi, its first quadruple homicide. With the town in disarray, Wendy Winchester, society reporter for the Rosalie Citizen, emerges as the sleuth intent on solving these women’s murders. Using her own desire to become an investigative reporter, some small town connections with the police and a willingness to unravel the bridge club’s secrets, Wendy sets out to find the killer. 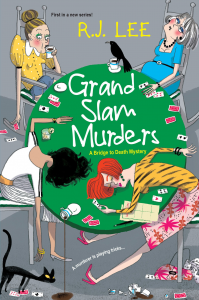 Though “Grand Slam Murders” is Lee’s first foray into mystery writing, this is his 13th published novel. Lee’s other novels were, in his own words, pieces of “humorous, small-town, Southern fiction,” but they’ve had an impact on his mystery writing. Lee, who was born and raised in the “writer’s laboratory” of Natchez, said that his Southern background has been a major influence on his writing. “I think I make a conscious effort to reflect aspects of the South that are realistic, even if that is not always positive. (It) makes for a better mystery,” Lee said. Though Lee’s Southern roots are in Natchez, Sewanee — where he received his B.A. in English — and New Orleans — where he lived for 30 years — he moved to Oxford in 2006 to support his niece as she studied theatre arts at Ole Miss. Lee said he enjoys living and writing in Oxford, citing both historic authors and current writers, such as Julie Perkins Cantrell, Ace Atkins and Neal White, as parts of the town’s legacy. He said he loves having Square Books in town and looks forward to reading there tonight. The next book in Lee’s new series, “Playing the Devil,” is set to come out in January of next year.